i am a total shaolin craftmaster, behold my MONKEY'S FIST ! i totally made that thing! crafternoon at keren's house. 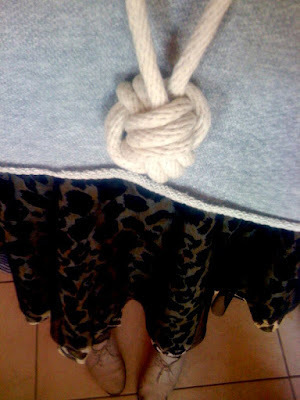 100 ft of rope from the hardware store on bedford ave ($11.00) + keychain ($2.50) + youtube videos of knots = DOPE! it's not perfect but its pretty cool. the hangman's telephone cord noose jangle? i don't know. i have like a million more feet of rope, gonna try and make more jangles! it's kinda fun. so radical...sorry i missed it. 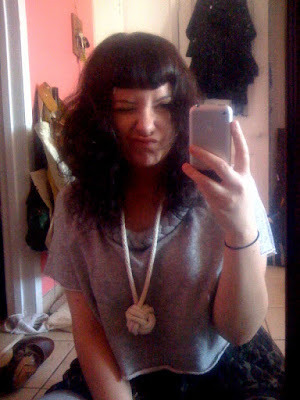 you know how i love a crafternoon+a resulting crazytown necklace. +i personally love your making faces face. i wanna see that face IRL woman! p.s.bday week dance off on the 15th!! 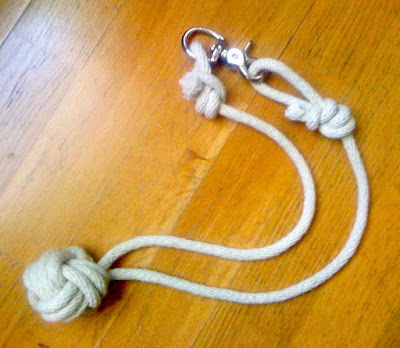 my boyfriend just gave me 'the boy scouts guide to knots' book... i'm planning similar craftinesses!!! hell to the yes lady! so want. also, you should make 2 more monkeyfists and attach them to a headband ear-style. knot bow? must figure that out. i love both of those! forever 21 is gonna rip you off and have them in stores in a couple of months, i swear. You know what I want to find? A pair of those curly shoelaces. That necklace reminds me of them. Ha I love it. No lies, very cool and very believable has something found at a sweet thrift store. wwe sell that knot stuff at the store dude, hahaha. 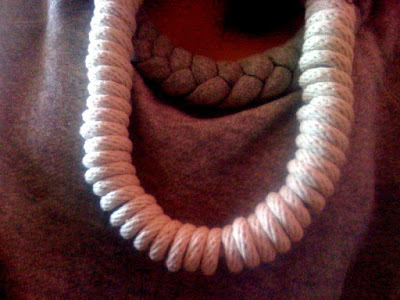 You should try making braided necklaces (and hoods) out of fabric scraps. They look kind of awesome. I downloaded a little booklet from the American Apparel website. Wow they look really good! Show us how you did them... please! I love the first one! Looks awesome! 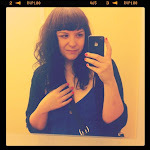 And I adore how you wear your bangs-I could never pull that off! 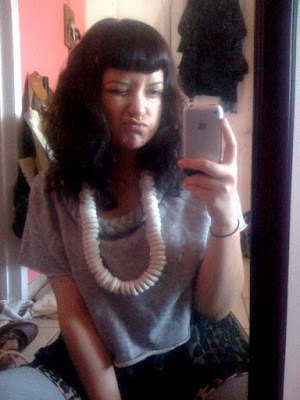 Gahhh I love DIYs. And it all looks great!